Ever since I wrote "How to Undermine Your Subordinates," I've received scads of requests for "How to Undermine Your Boss." Must be a lot of unhappy subordinates out there. Well, this one's for you. 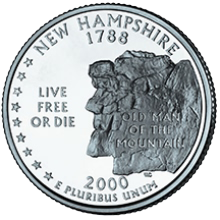 The reverse side of the U.S. quarter dollar coin issued in 2000, honoring the state of New Hampshire. The image depicts a rock formation on Cannon Mountain that was known as "The Old Man in the Mountain." It collapsed sometime between May 1 and May 3, 2003. The date is a bit uncertain because the mountain was shrouded in clouds and fog on the days before May 3. The formation collapsed as a result of water penetrating its crevices and repeatedly freezing and thawing. Eventually, this weakened the structure, and it collapsed of its own weight. Something similar often happens at work, because the incompetent and corrupt eventually destroy themselves with very little assistance from others. Sometimes, though, the process takes longer than subordinates would like, and this might be the source of the urge to undermine the boss. Photo by U.S. Mint courtesy WikiMedia. Recently I wrote a piece about how to undermine your subordinates. It ended with a facetious comment about my forthcoming article on undermining your boss, which I had no plans ever to write. But I've had so many requests from readers (some of them obviously desperate) that I was compelled to write what you're about to read. But I've learned my lesson, so here's a facetiousness warning: almost none of the following is serious. The First Principle of Undermining Your Boss is: Don't Get Caught At It. No, wait, that's the Second Principle. The First principle is: Do Not Ever Do It. Ever. It should be obvious why not, but here's the reason: Your Boss Can Get or Already Has Much More Powerful Tools for Revenge Than You Do. OK. Now we have that out of the way. Here's how to do it. Some people hope they can get their bosses transferred or terminated, or even take over their boss's job. These outcomes are extremely unlikely, because every incompetent boss who somehow stays employed has a supervisor who wants it that way — or who is just as incompetent. Fixing things is a fantasy. The only reason to even try to undermine your boss is Ecstatic Enjoyment. Oh, and maybe sometimes Revenge. When you notice something happening that you could help with, don't. Pretend you didn't notice it. Go to lunch. Whistle a merry tune. Of course, if your boss asks you to assist, that's completely different. But since your goal is undermining your boss, requests for assistance always present delicious possibilities. for very long Resources can work magic. But they need a reason. Ask for a confidential counseling session. Confidentiality might seem to be counterproductive here, but remember: nothing juicy in Human Resources is ever really confidential for very long. In the session, ask in a solemn tone, "If someone knows of something unethical going on, are they obligated to report it?" Ignore the answer. It's asking the question that counts. If that doesn't get HR going, then ask, "If someone wants to report something unethical, how can I do that anonymously?" In public, always support your boss. Since undermining is your actual goal, you don't want to be on the list of suspects when they try to figure out who could have said or done whatever was said or done. But don't go overboard. Don't actually do anything that would help. If your co-workers all hate you, then your public stance is working. You're safe. From your boss, that is — from your co-workers, maybe not. Would you like to see your comments posted here? rbrengfMoSDuBZNyYXSEmner@ChachWzJgWdjqFHHdbmkoCanyon.comSend me your comments by email, or by Web form. When teams solve problems together, discussions of proposed solutions usually focus on combinations of what the solution will do, how much it will cost, how long it will take, and much more. Disentangling these threads can make discussions much more effective. Some see workplace politics and integrity as inherently opposed. One can participate in politics, or one can have integrity — not both. This belief is a dangerous delusion. I offer email and telephone coaching at both corporate and individual rates. Contact Rick for details at rbrencxHrwSMYumeMHFCcner@ChacWNZkyahbjMsHyUCgoCanyon.com or (650) 787-6475, or toll-free in the continental US at (866) 378-5470.